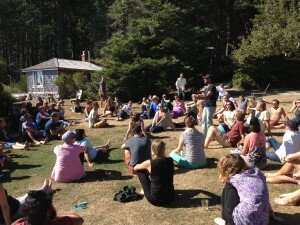 Social entrepreneurs communing in the great outdoors at SVI at Hollyhock. Imagine five days of this: explorations into the democratization of capital; opensourcing redressing fossil fuel extraction on indigenous lands; delicious and healthy meals; engineering how to scale a social business; a sing-along with a major financial cooperative rep about how joining together makes us happier; the joys of flow charts; plus rainforest and an exquisite beach. 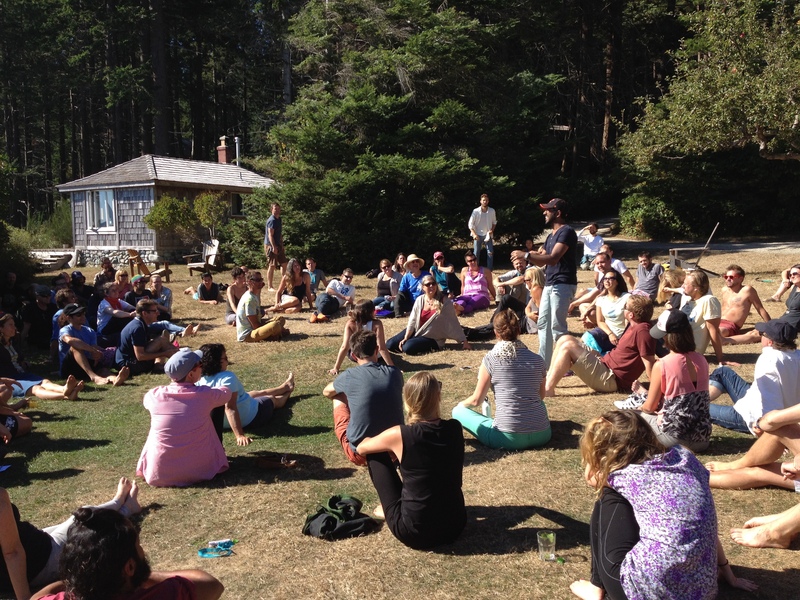 I’ve attended the annual Social Venture Institute at Hollyhock for five years, and its showcasing of the human spirit and ingenuity never ceases to educate, inspire and delight. Marketed as an opportunity to “join business leaders and social entrepreneurs … for an intensive, interactive inquiry into how to face the day-to-day challenges of running a socially conscious enterprise,” this annual event explores the frontiers of sustainable entrepreneurship and sustainable non-profits, also called social ventures and social enterprises. This year I taught a workshop at SVI on “Buddha and the Entrepreneur,” sharing classic Buddhist foundations together with modern interpretations and exercises that can be applied effectively in daily life. As a Capricornian pragmatist, I enjoy focusing on how the rubber of the beautiful Buddhist principles hit the road when the going gets tough in at home or at work. Social entrepreneurs are familiar with the creative tension arising between wonderful ideals and … er, stress. It was a pleasure to share with like-minded souls. Freshly returned from SVI, I’m faced with the luxurious challenge of transforming an abundance of useful advice, feedback and other notes into action plans I’ll undertake for my own business and for our retreat center, a social enterprise. It feels as though my social capital and intellectual capital accounts just got big fat deposits, the same feeling as after a big Thanksgiving or holiday meal … with more leverage and future prospects. All I had to do was invest in showing up, share what I have to offer, and be willing to acknowledge that, at times, others’ perspectives may be more accurate or useful than my own. In short, trust. There’s that social capital again.